Bethune Bulldogs 2018 Robert Schultz Cup Champions! 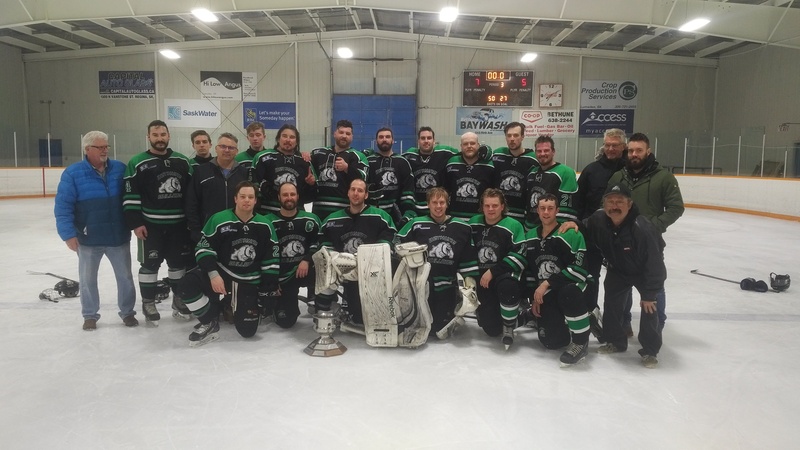 The Bethune Bulldogs defeated the Raymore Rockets 7-5 in Bethune on Sunday to claim the Robert Schultz Cup. The Bulldogs are the first team in the 52 year history of the Highway Hockey League to win four consecutive titles. The Bulldogs scored the first three goals in the first period. Drew George, Russ Nielson and Derek Fuchs scored to give the Bulldogs a 3-0 lead. Tyrell Shulko would score with a shot over the left shoulder of Ryan Holfeld on the power play late in the period and it was 3-1 Bulldogs. In the second period Michael Jordan would score in the first minute of the period to get the Rockets within one goal. Todd MacMurchy would then score to even the game at 3-3. The Bulldogs would come back to take the lead midway through the period on a goal from Joel Kot. MacMurchy would then get his second goal of the game on the power play with just over three minutes left and the game was tied 4-4 going into the third period. Five minutes into the third period Derek Fuchs would put the Bulldogs back up 5-4. With just over eight minutes left in the period, the Bulldogs had a two on none and Russ Nielson made no mistake with a goal that would prove to be the game winner. Josh Jordan would score with five minutes left to get the Rockets to within one goa. Drew George would complete his hat trick with a goal with just under four minutes to go and the final would be 7-5. Ryan Holfeld would pick up the win stopping 22 shots and Dean Brothen would stop 43 shots in the Raymore net. Brothen faced 154 shots in the three games against Bethune. Raymore went 2/4 on the powerplay and Bethune was 1/4 on the power play. Seven times in 52 years we have had back to back champions and Bethune was the first team to win three seasons in a row last year. They are also now the only team to win four championships in a row. Individual award winners from both teams were presented with their plaques and Captain Russ Nielson was presented with the Robert Schultz Cup, again. The Bulldogs AAA team will now compete in the Allan Cup in Rosetown April 9th -14th. The Bulldogs play two round robin games. The first is on Monday, April 9th at 4:00 p.m. and their second game is at 4:00 p.m. on Wednesday, April 11th. They will have a playoff game on Thursday or Friday. We will keep you up to date on Twitter and post game times on our front page. Another season for the Highway Hockey League is in the books. A sincere thank you to our volunteers throughout the league, to our officials, to the executives and Managers of our teams and of course to the players and Coaches for the commitment to keep senior hockey alive and strong in Saskatchewan...a sincere thank you to all of you. The league will have a spring meeting in April and the time will be posted when organized.